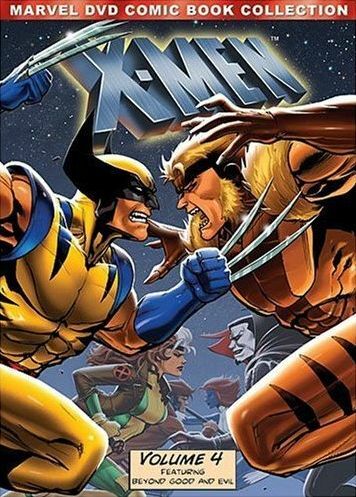 The third and fourth volumes of that old X-Men cartoon from the 90s has recently been released, and although I didn't have any mutant love for the show after watching the first two volumes, I have to admit that I enjoyed these next two volumes. Maybe it was because in between, I watched both the old G.I. Joe cartoon and the old Transformers cartoon, and realized how outlandish and filled with plot holes their stories were. Compared to those two cartoons, the stories here are way better. The first disc of volume three contains the most excellent Dark Phoenix saga. 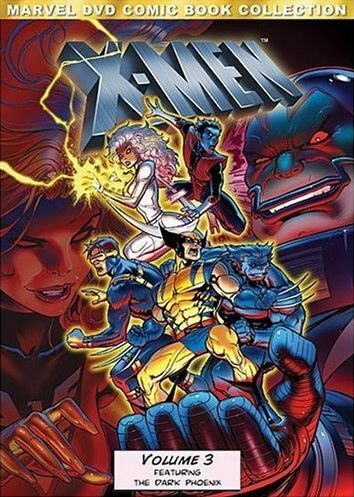 You may recall that the cover art for volume 2 featured Dark Phoenix front-and-center, even though the Dark Phoenix never made an appearance in that volume. Now, she is placed on the cover of volume 3 as well, but it's just her face, and it's faded into the background. Kind of strange way to advertise the volume which houses her story, hiding her away like that, since she is so cool looking (and totally hot). Oh yeah, and the storyline involving their friend turning into a being capable of destroying entire star systems is pretty cool too. New mutants also show up in these episodes, such as Dazzler in episode 37: Dark Phoenix: Dazzled (I had a couple of her comics when I was younger), Iceman in episode 41: Cold Comfort (I love playing as him in the Marvel Alliance videogame), and Nightcrawler in episode 44: Nightcrawler . It's nice to see new characters show up as a natural extension of the universe, rather than just feeling like a way to keep a tired old show feeling fresh and new. Then we also get some episodes which expand on the back stories of previous characters, like Wolverine and Cyclops. I think my personal favorite episode in volume 3 would be the two part One Man's Worth , which involves time traveling and alternate timelines, and where we get to see a young Professor X who can't even fathom becoming the great leader that he is described as. It's always fun to see the great characters as they were before they grew into their full potential. Volume 4 starts off with a two-parter called Proteus, which is followed up by another two-parter called Sanctuary, and then a four-parter called Beyond Good and Evil. Between those, and the three multi-episode stories in volume three, there are quite a bit of muli-parters, so it's unfortunate that the DVD producers didn't give an option to play those episodes back-to-back without opening and closing credits. The 25th anniversary release of Transformers provided that option, and I think these volumes could have really benefited from it, but at least they provide the ability to chapter skip past the opening credits and the previous episode recap. There are no extras to speak of on any of the discs, but I really didn't mind. The episodes themselves were plenty entertaining.